Forth Valley Nurses’ Choir is making a name for itself by singing at hospitals and charity events. Their audiences – including people with dementia – experience emotional release during the songs, while the nurses benefit from the camaraderie and wellbeing associated with singing in a choir. When the Forth Valley Nurses’ Choir sang Christmas songs to older patients last year, they didn’t anticipate the impact they would have. The audience – including people with dementia and their families – started to join in, and there were definitely tears. 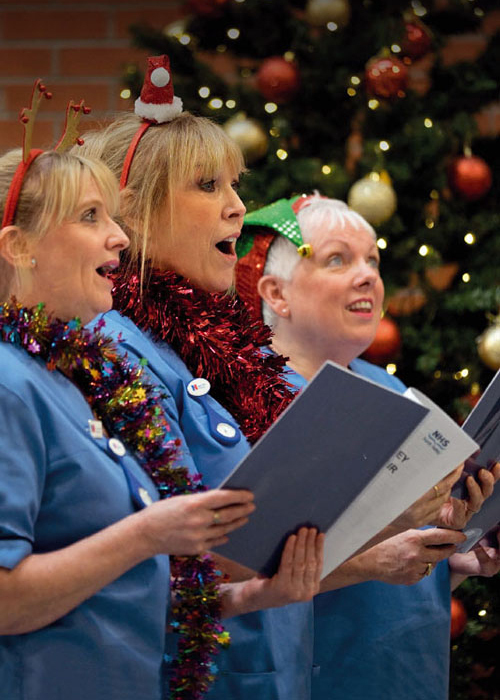 This Christmas, the choir, made up of nurses working across NHS Forth Valley in central Scotland, will be hoping for a similar effect when they sing at local community hospitals in Falkirk and Stirling, and at charity events and concerts. That their singing benefits the audience is evident, but it can also give a boost to the singers themselves. There is a growing body of evidence that singing in a choir has a positive effect on health and wellbeing. This does not surprise Ms Paterson, a senior charge nurse with the health board. ‘It’s a great stress reliever,’ she says. The idea for the choir was first mooted before Nurses’ Day last year. Rita Ciccu Moore, now associate nurse director with NHS Forth Valley, thought it would be a great way to bring nurses together, but the idea almost didn’t get off the ground. ‘I wasn’t confident to lead it myself,’ Ms Ciccu Moore says. She was put in touch with Philip Todd, an actor and musician who studied at the Royal Conservatoire of Scotland, who was prepared to be their choir master. The choir started rehearsing in earnest on Thursday evenings in September 2014, and quickly the whole idea gelled. Their repertoire is eclectic, ranging from Scottish songs to pop and jazz classics. Christmas songs go down particularly well. Expenses so far – including paying the choir master – have been met by the health board, using a small endowment earmarked for nurses. The members also pay £10 per month, which will cover travel costs and equipment, such as the essential Santa hats. Ms Ciccu Moore’s advice to any other nurses thinking of starting a choir is to keep it simple, not to expect too much and make sure it is non-hierarchical. ‘It’s great fun; it’s an amazing feeling when you get out there and sing,’ she says. The choir is making a name for itself. This year it won the volunteer category in the NHS Forth Valley staff awards and invitations to perform are on the rise. Charities are benefiting too – the choir has raised hundreds of pounds for Children in Need and other causes, and plans to do more fundraising in the future. But what of the benefits to the choristers themselves? According to Raymond MacDonald, professor of music psychology and improvisation at Edinburgh University, singing in a choir brings several health benefits. ‘It means coming together in a social context with a shared goal. It involves working together, and expressing yourself emotionally. Music has well-recognised therapeutic benefits, he adds. Professor MacDonald stresses that singing in a choir is not a ‘magic bullet’. In 2010, research published in the Journal of Evolutionary Psychology suggested that the active performance of music releases ‘feel-good’ hormones, giving the performer an endorphin high. One theory is that heartbeats synchronise when people sing in a choir, and that this has an impact on health and wellbeing. Research from the Sidney de Haan Research Centre for Arts and Health in Kent found that singing in a choir contributes to psychological wellbeing. Australian research published in 2013 suggested that group singing is a ‘joyful activity that promotes wellbeing and is life-enhancing for those involved’. Angela Wallace, executive nurse director for NHS Forth Valley, was keen to support the choir from day one. ‘Rita had spoken to me about starting a choir and I thought it was a great idea to create team spirit,’ she says. ‘It was important that it was for nurses. In Forth Valley, we work across a single system [community and acute] so we have nurses who are working in different places coming together to sing. The health board also has a midwives’ choir, which this year was asked to perform at a Royal College of Midwives’ event at St Giles’ Cathedral in Edinburgh. One of the highlights for Professor Wallace was the nurses’ choir singing Silent Night in German while one of the members, Lynn Waddell, signed it for anyone in the audience with hearing difficulties. Ms Waddell, equality and gender-based violence manager, whose late grandparents were deaf, believes the choir members are well rewarded for the efforts they put in. ‘I’ve always sung and have always felt it’s a fantastic way of giving something back while having a good time,’ she says. Ms Paterson agrees: ‘Sometimes if I’ve had a bad day I’ll think about whether I have the energy to go, but I will make the effort and I’m always glad I did.